We may see a slew of electric vehicles arriving in India in recent future. 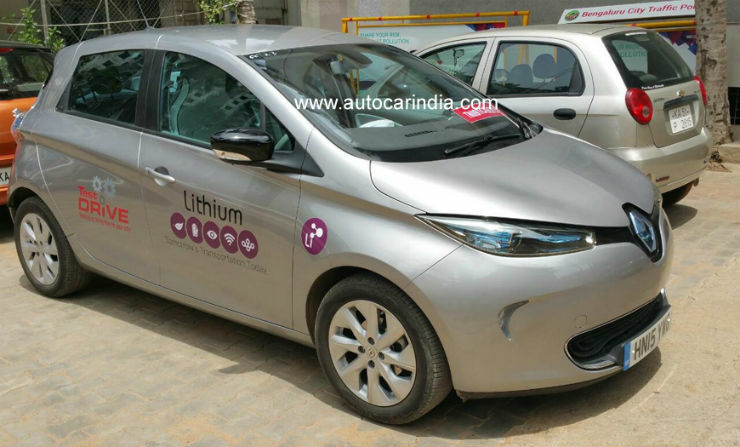 The French manufacturer, Renault has got their electric vehicle, Zoe to India and it has been spied testing. The electrically powered hatchback has been seen as a part of the Bengaluru-based electric cab aggregator Lithium Urban Technologies’ fleet. Renault may showcase the vehicle at the 2018 Auto Expo. The hatchback can do 400 km on a full charge according to new European Driving Cycle. It gets a massive 41 kWh battery that can be charged to up to 80 percent from nil in just 65 min via quick charging. Renault says that the real world driving range is about 300 km and the battery takes 8-9 hours to charge completely using a standard 7kW charger. Internationally, the Zoe is equipped with 16-inch alloy wheels, a hands-free key card with push button start/stop, leather upholstery, rear parking camera and heated seats. If the vehicle comes to India as cab then we will see a lot of features missing from the list. Manufacturers will start rolling out their products in the EV segment or will soon start testing their products in the Indian condition. This comes after the Indian government ambitious plan to make India an EV only nation by 2030. Cab aggregators in many cities have started testing the electric vehicles for their fleets in India. As India still lacks the infrastructure for successfully implementing electric vehicles, cab aggregators have built stations to charge the electric vehicles. Indian car market is expected to get EVs from other manufacturers as well. Nissan is planning to bring in the Note e-Power while Hyundai is planning to showcase the Ioniq and the Kona electric in India. Other manufacturers like Jaguar, BMW and Mercedes may bring in their respective electric cars to showcase at the 2018 Auto Expo.